How to Create Content Upgrades with Thrive Content Builder! →How to Create Content Upgrades with Thrive Content Builder! We've all be made to believe that the only way to easily create content upgrades is to buy some dedicated plugins. That's not true! Thrive Leads is a powerful list building tool. But in this post, I'll show you how to create high converting content upgrade with Thrive Content Builder. NB: Thrive Lead and Thrive Content Builder are two different plugins by the same company! If you don't have a copy of Thrive Content Builder, you can get ﻿one here. The reason is that this will allow you create animated, eye-candy, stunning and sticky blog posts. In addition, you are going to have to remove many other plugins from your blog because Thrive Builder is a bunch of functions​ that do the same things over 10 different plugins can do. Content Upgrades is one of the most powerful list building methods out there. Thrive Content Builder makes this incredible method more easy for us and more accessible to use. Content Upgrades is simply a situation where you make post-specific opt-in offer. This is not a generic offer but something that specifically extends the purpose of a post and that is made just for the post. How to Create Content Upgrades with Thrive Content Builder and remove 10+ additional plugins from your blog! You write a blog post teaching your readers different methods to make their first $5000 a month and In the content upgrade, you write an ebook in which you give details (including tools, products, traffic,etc) how you made your own first $5000/month. Sometimes you may have a long blog post and you want to have a pdf version of it as an upgraded content. It could also be a video or podcast version so some readers may want to get the same post but in another format. First, you have to create your signup form with your email marketing platform (AWeber, MailChimp, GetResponse, iContact, etc) and get the subscription form's html code ready. Go to Thrive Lightboxes and click Add New! 2 - Click "Publish" to save and activate the light box. Don't be afraid. It's not going to be added to your list of blog posts or pages​. Now, this is just the skeleton. What we'll do now is to add the form and some text. So drag and drop the Lead Generation object from the Content Builder Tool bar. Follow the red arrow. The next step will be to add some text to the form and make it more beautiful. You have the Paragraph/Text Element tool on the Tool bar. See it as indicated by the arrow in the image. 4 - I added another text box where I typed another text. This is purely optional. Now, click on the form with the left mouse button. Here, there are tons of options to control and design your form. If you click "Horizontal", (In my case) you will have the option to change your form back to vertical. But we are more concerned here about connecting our form to our email service through the HTML form code generated. So click Connect with Service as indicated by the arrow​. Just click on the "Create a new Connection" button to move to the next step. On the next Window, select "HTML Form code" from the select list and click to the next step. On the next screen, you are certainly going to see a large box where you should insert your HTML form code copied from your email marketing platform. Take note that your field properties may be completely different from mine. The Name and Email fields should be properly named and marked as required. If you want more beauty and professionalism, check the options to add icons and pick relevant icons from the library​. Have you noticed any difference now? The red arrows show the field labeling while the green arrows show the icons. Looks great right? The next step is very simple but crucial. We are going to attach the lightbox to a click event on text. That is, if a reader clicks the text, the light box should beautifully show up. 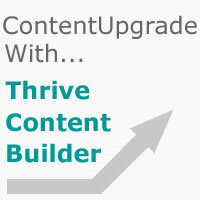 Remember we are working on how to create content upgrade with Thrive content builder. So how do we attach the light box to a link? First, select the text you want to link the lightbox to and use the hashtag as the value of your href attribute.Then click "INSERT"
Once the link has been applied to the text, click it. This will popup the tool box, this time with the Event Manager activated. You notice from this image above that the Event Manager is active. See the arrow. On the next window, we will select the Open Thrive Lightbox option from the list of actions. Now, select the light box from the list. Just below it is an option to animate it. Try around and get something that's good for you. Then click to save the event. Click the 'Close' button and make sure you save changes before previewing to see the created content upgrade at work​. Pretty simple to create content upgrades with Thrive Content Builder right?. So here is a recap of the steps we've just taken​ to create contentupgrades with Thrive Content Builder! We've got the HTML form code from the email marketing platform. We've created our lightbox and linked it up to the email platform through the HTML form code. Finally, we've been able to tie the lightbox to a hyperlink. So each time the link is clicked, the box will nicely show up. Each week you keep showing me why I should get my hands on the Content thrive builder. I wish you had listed the 10 plugins that this awesome plugin replaces. That’s coming up soon. I’ll give a list of plugins to take down with thrive content builder. Getting your visitor to give you their email is no small feat. You definitely need to have a strategy. I noticed this site wants to give you the 3 steps to get your email. Very effective. Enstine, Very well done mercy I almost understand. I love reading here and my apologies for not commenting as many as I read. Mr Smart Guy you are one of my favorites because you explain so very well. I’ve not even got a site set up yet . Keep up the great work. Very nicely done demo. It sure makes the Thrive Content Builder clear. I actually do a content upgrade process, but I use LeadPages for lightbox optin. LeadPages is a premium annual fee product, though, and Thrive may be a better alternative. I like the animation too, that’s a lot of fun. More than fun, I think it encourages people to optin because it feels more interactive than a static lightbox. This is an excellent plugin for people because it will get them in the habit of upgrading their content. People always ask me “how do you make money blogging”? Well, Adsense and all the ad links aside… this is the best way to monetize your content… by extending it (upgrading it) into premium content. Congrats on doing such a great job with this. Yes LeadPages has been leading the market for long but the recurring charges is making it more and more unpopular. Absolutely wonderful. You are awesome to show us all of the great features of Thrive Content Builder. It sure makes it easier to follow your directions than figure it out myself. It’s getting easier, once you get started with it. Just takes determination. Yes it’s getting easier once you get started and I love the new things I keep discovering with this tool. How far are you gone with your copy? You are awesome to show us all of the great features of Thrive Content Builder. Amazing tutorial thanks for sharing. I really appreciate your work. Thanks for sharing. I am just pleased by the way you present your writings. As well as, you shared all the informative posts too. I am a follower of your writings. Keep helping us with such posts. It almost 1.5 year i found your website while making research on paypal services for Cameroon. It was such a nice discovery! you have so meaningful posts. Please keep up the good work. Recently, i have especially enjoyed one of your post about Thrive content, so I decided this day to buy it through your affiliate as a way of expressing my gratitude for your work. Of course, this tool will help me to accomplish some good work. If you bought TCB, you must be a blogger. What’s your blog? Thanks for your sweet reply. Well, I don’t yet have a blog, but i am about to. So your post was very timely to get such a smart tool. This will handy to make some nice posts. I really appreciate the idea of being connected and of course i will let you know when my blog is live. Whoa!!! Thrive Content Builder is amazing!! !It felt very interactive to me.The toggles appears unique and visuals are great.Keep up the beautiful posts!!Thanks!! I never knew I could this stuff too with Thrive Content Builder. I just use Thrive Builder to edit posts and make my content look enticing but just now I got to know about this. This Was the post i was Searching how to use content thrive builder and upgrade version.There was some confusion in my mind which has been cleared by this Post. I praise the author for his writing skill and creativity. Thanks for sharing the post and helping bloggers like us.